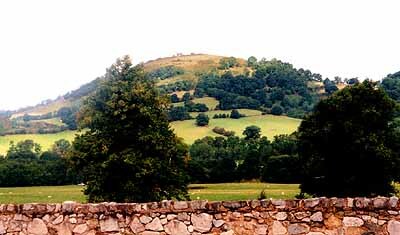 The major claim to be Castle Corbenic, the Grail Castle, is held by Castell Dinas Bran above Llangollen in North Wales. Though the present castle is certainly medieval, it stands on the site of an ancient Iron-Age hill-fort, believed to have been the home of the Kings of Powys, well into the 8th century. It is particularly associated with King Elisedd of Eliseg's Pillar fame. The castle is, however, named for King Bran Fendigaid (the Blessed), a Celtic God known from both Welsh and Irish mythology who was later mortalized into a monarch of North Wales. The name of the Castle of Corbenic appears to stem from Corbin-Vicus. The ending is almost certainly derived from the Latin for "Settlement," while Corben is a French translation of the word Crow or Raven: Bran in Welsh. Castell Dinas Bran is, in fact, sometimes known as "Crow Castle". In Welsh myth, Bran Fendigaid, like King Arthur's knights, went on a long journey to recover a magical vessel of plenty: a Celtic Cauldron of Rebirth. Like the Grail-King, he was wounded by a spear and the land perished until he was healed. It would appear that Bran was the first of the Grail-Kings of Arthurian legend, named Brons. He was the son-in-law of St. Joseph of Arimathea.